Health-friendly bedding features a lab tested, extra tightly woven cotton cover that blocks dust mites and their allergens. Provides fluffy year round comfort plus long-term protection. My first down comforter and I'll never go back to a "down alternative" synthetic fill. They're always so horribly heavy and uncomfortable, and the type of warmth they provide is excellent. Our exclusive AllerRest Fabric® will give you peace-of-mind knowing that the special fabric weave keeps dust mites and other allergens at bay. Lab tested 300 thread count AllerRest ® fabric and 550 fill power Hyperclean® down work together to deliver fluffy comfort and long-term dust mite/allergy control. A sewn through box construction and Comfort Lock® border keeps the down evenly distributed for night-long warmth that won’t shift to the edges. White cording and practical loops complete this health-friendly comforter that’s excellent for year round comfort. Keep your comforter clean with a duvet cover or comforter protector. 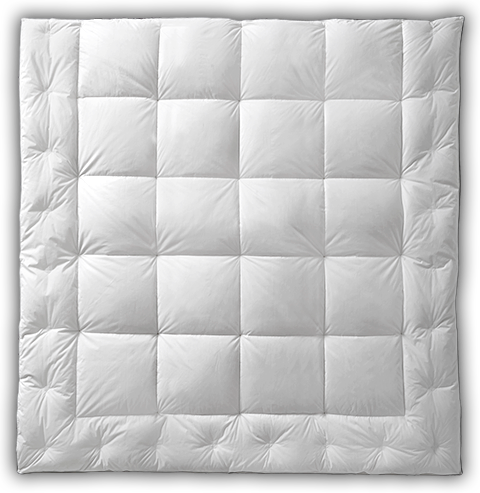 This comforter fits in the Basic or AllerRest® comforter protectors. Convenient duvet loops in all four corners of our comforter help to keep it from shifting inside your duvet cover. Securing your comforter inside a duvet cover is as easy as attaching these loops to your duvet using clips or ribbon ties, depending on your individual duvet cover's design. Helpful Hint: To easily insert your comforter into a duvet cover start by turning your duvet cover inside out. Next, place your comforter on top and attach duvet loops to the cover. Finally, turn the comforter and duvet cover right side out and you're done! Special, extra tightly woven AllerRest® fabric prevents dust mites, dirt and harmful allergens from penetrating into your bedding. This unique chemical and pesticide-free fabric has been lab-tested and proven to be an effective barrier against dust mite transfer. It is woven with 300 thread count, 100% cotton so it's soft to the touch maintaining your ultimate comfort. AllerRest® fabric provides long-term protection against daily allergen exposure, ensuring a high quality of performance for your bedding investment. This Pacific Coast® comforter features our distinctive Comfort Lock® three-sided border system designed to hold the down in the center, over your sleep area instead of shifting to the bottom and edges. Evenly spaced cross stitches within the border work to keep the down in place giving the border its fluffy, well-filled look. Instead of wasting down on the sides and bottom of your bedding like ordinary comforters, Comfort Lock® allows us to use the down much more efficiently to provide you with cozy warmth.